I’m so excited to share this! First of all, you should know that both Branden and I are suckers for kitchen gadgets and cookware. We have zero self control in stores like Williams-Sonoma and Sur la Table. Seriously, this is a real problem because we have a really, really tiny kitchen (I’ll have to post photos sometime because its truely unbelievable given the amount of cooking we do). Anyways, back to the real reason for the post…Branden and I are on the email list for Today’s Kitchen Store and were quite intrigued by last week’s email about a new product demo for a “Stovetop Smoker.” What could this contraption be? I’ve eyeballed The Smoking Gun for awhile now for creating smokey food without a grill, but at nearly $100 needless to say, its not part of our kitchen gadget repertoire at this point. Bottom line: we had to check this demo out (plus they offered food samples made in the smoker, so that’s always a bonus). 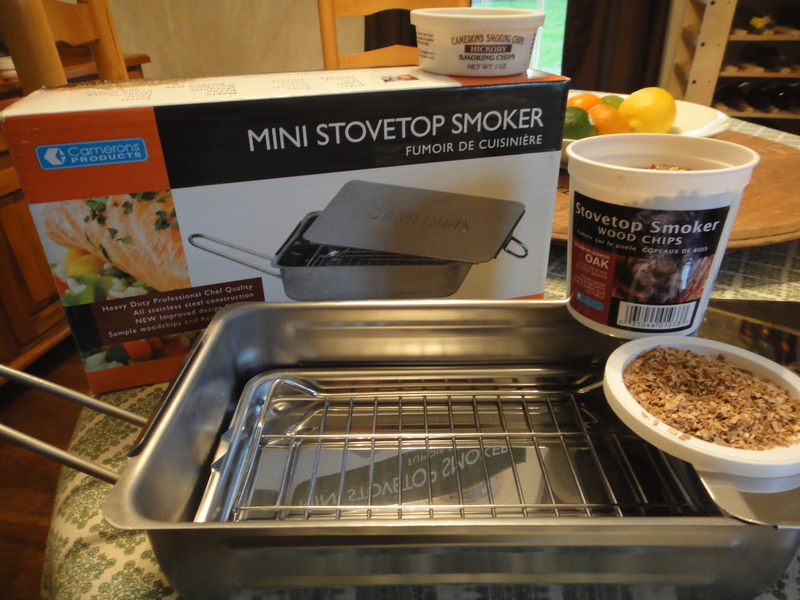 Formally the Gourmet Smoker by Camerons Products, this is a pretty cool product. Although we haven’t tested it out personally yet, I figured I’d talk about it so when I do finally post a recipe made with it, I’m not rambling on for days about the gadget AND the food created. We did however sample some potatoes, stuffed grape tomatoes, chicken breasts, and brie that were made in the Smoker and were so happy with the results that we clearly left the store with one of our own. The Gourmet Smoker is basically a stainless steel box with a wire rack and drip tray underneath which you place tiny wood chips that begin to smoulder when placed on a hot stovetop. Place your food inside, wait to see a bit of smoke, and cover with the stainless steel lid; you’re that much closer to smoky-flavored food. Thankfully, to ease some anxiety over using this basic box, a cooking guide comes with your purchase complete with cooking times and suggested wood types. What are the other “flavors” of wood chips you ask? Well let me share (excerpts from the Gourmet Smoker Cooking Guide)! Alder: Famous in the Pacific Northwest for smoking salmon, this mild wood is the chef’s smoke choice when looking to create a delicate smoky flavor. Use with seafood and veggies. Apple: This fruitwood is more complex than alder, yet is still quite mild. Excellent for game fish and poultry. This wood also works quite well when soaked in water then sprinkled over the coals of your BBQ when grilling chicken or steaks. Bourbon Smoked Oak: (Branden and I purchased this one) Infuses gentle bourbon flavor. Great with ribs, brisket, and other red meats. Cherry: Rich in flavor, yet very smooth. It is a killer with Cornish game hens, duck breast, and vegetables. Hickory: This is a classic hardwood that creates a lot of depth in its flavor yet is not harsh. A perfect choice when using BBQ sauce on pork ribs or chicken. Maple: Creates subtle flavors and is perfect for creating just the right balance of taste in delicate foods, especially when smoking cheese and vegetables. Mesquite: Flavor of the Southwest, from smoked chicken tacos to smoked chile rellenos. Overuse can make foods bitter! Oak: The backbone of smoking flavor. Oak is widely used in commercial smoking and works well mixed with other woods. Wonderful with apple for smoking homemade sausages. Pecan: Made popular by being used for President Bush’s Inaugural Dinner. This is really a fun flavor that adds a lot to the taste of pork, game, and lamb. Pecan is excellent when mixed with other woods to provide a well-balanced flavor. Like I said earlier, I’m really excited to try out this new toy and will be following up this post with my personal review of the product from a usage standpoint. I can’t imagine I’m going to have much bad to say about this as long as the owner of Today’s Kitchen Store wasn’t totally yanking our chains (we’ve grown to like and respect them, so I’m pretty confident that he wasn’t). Bottom line, the food we sampled was delicious and if this little metal box holds up to the hype, we finally have a simple way to create smoky foods without breaking out the charcoal grill. Hallelujah!